Incidence, prevalence, and statistics are all irrelevant to menopause as it is a physiological process in a female and thus cannot be narrowed down to any values; however, it does predispose to various pathological conditions. For some females, it represents a profound life crisis while others refer to it simply as cessation of menstrual function. The word menopause originally comes from the Greek word for month and cessation and at times used interchangeably with the term climacteric, which signifies events associated with “the changes in life.” An estimated 80% of females experience physical or psychosocial symptoms while approaching menopause, leading to change in their quality of life (QOL). These physiological and psychological changes are due to estrogen deficiency. The World Health Organization defines QOL “as an individual's perception of their position in life in the context of culture and values system in which they live, in reference to their goals, standards, and concerns in life.” Menopause is known to bring about changes in an individual's QOL through various factors, one of the major ones being the area of residence. Women in rural setup demonstrate a relatively poor QOL compared to those in the cities. The level of education is also known to indirectly affect the severity of symptoms, which is demonstrated in a study conducted in Bhavnagar and Surat, which concluded that as the education level increased, awareness toward menopause and its related problems also increased, leading to better QOL. A lot of literature is already available on the effect of menopause on various aspects of life in urban areas; however, there is a significant lack of information from the rural setup.,, As a living condition, education and many other factors differ in the rural area; it is quite necessary to assess the severity of menopause-related changes and their coping mechanisms. It is also very important to assess the family atmosphere and their attitude/behavior toward this challenging phase of women because family is considered as the main support system for any individual. Thus, a holistic analysis of change in QOL during menopause in the rural setup is highly essential to understand the situation and plan any future intervention for them. The cross-sectional survey was conducted in two villages of rural Gujarat, India, between December 2013 and April 2014. Assuming a prevalence rate of 50% (for maximum sample size) and an acceptable difference of 10% the calculated sample size was 97. From hospital catchment area, 250 families were approached, of which 111 were found to fulfill inclusion-exclusion criteria. The nonresponse was about 10% from the eligible participants for reasons of the inconvenience of the timing of interview or their household-related work priority, and thus 100 couples were included in the study. The ethical approval from the Institution's Ethics Committee was obtained before commencement of the study. Inclusion criteria were married females, within 10 years postmenopause, with an intact uterus, who have not been on hormone replacement therapy in the past 6 months; while exclusion criteria were women who did not have their husband available with them to respond to the interview/questionnaire for any reason. Village health workers (VHWs) of the villages were approached to understand the population and work out a suitable time for data collection from the participants. Simultaneously, using the demographic data from the VHWs, a list of females tentatively known to have attained menopause was prepared for ready reference. Based on the list, females were approached at their residence. If the inclusion-exclusion criteria for the woman were fulfilled, the couples were briefed about the project. On their voluntary consent, they were enrolled in the study and interviewed for data collection. A female and a male interviewer interviewed the woman and her husband personally at the same time in separate rooms. Only one male and one female interviewer did the data collection for entire study. The details of sociodemography, menopause-specific QOL questionnaire (MENQOL), brief cope questionnaire, and personal health Questionnaire  were collected from the women and responses on brief cope only were taken from the male counterparts. The demographic variables collected include information on age, age of husband, residence, education, occupation, income, comorbidities, menopausal age of woman, etc. Socioeconomic status was documented using modified Kuppuswamy scale. MENQOL, a standardized questionnaire designed by Sunnybrook Health Science Centre, comprises 29 items clubbed into four domains (vasomotor, physical, psychosocial, and sexual). The design of the tool is such that it allows the assessment of the prevalence of symptoms and its effect on QOL through “bothered” scale simultaneously. Official license from the developers was obtained, following the required protocol. The process included translation, back translation, and verification of the translated tool by the developers. The translated tool was then administered for pretesting on 15 females visiting gynecology department. On satisfactory functioning, the tool was used for data collection in the study. For documenting coping by the affected women (those who report of some level of botheration due to menopause) and their spouse, “Brief cope questionnaire” was used. An official translated version of the questionnaire is already available, and thus, it was directly utilized for data collection. This 28-item questionnaire assesses 14 coping strategies used by the individuals, which can further be grouped into three categories (problem focused, active coping, and avoidant coping). Apart from the above, the standardized Personal Health Questionnaire was used to diagnose and grade depression in the participants. All affected females were interviewed with this tool to assess whether they suffer from depression due to menopause. Data from the study were analyzed in SPSS version 14 (Chigago, IL, USA). Sociodemographic variables and prevalence of menopausal symptoms have been documented in frequency and percentage. MENQOL botheration scale ranges from 1 to 6, where one denotes the least botheration and six as maximum. To further simplify analysis of botheration due to menopausal symptoms for the study, scores 1–6 were categorized into mild (1–2), moderate (3–4), and severe (5–6). To compare scores across categories, independent t-test was used and regression analysis for finding factors affecting outcomes. Coping scores as per Brief Cope Questionnaire for each strategy range from 1 to 8, one being least used and eight being the most used mechanism. Fourteen strategies were further assigned into three domains, where problem focused domain scores range up to 32, while active emotional and avoidant emotional range up to 40 individually. Hundred women and their husbands were included in the study. The mean (standard deviation [SD]) age of menopause of the women in the study group was 49.74 (6.5) years. The mean (SD) age of the husbands was 54.89 (6.9) years. 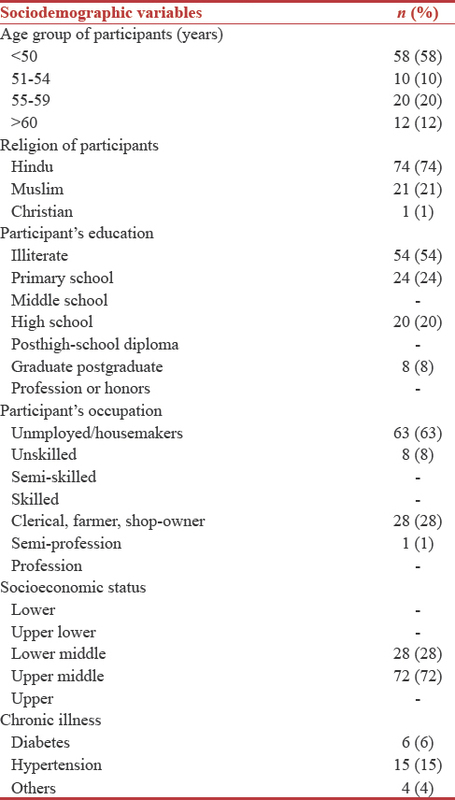 Other demographic distribution of participating women is given in [Table 1]. The prevalence of menopause-related symptoms was found to be 47% in the study. The prevalence of at least one symptom related to vasomotor was 21.3%, physical 91.5%, psychosocial 44.7%, and sexual was 0%. Individual symptom-wise prevalence is listed in [Table 2]. Univariate analysis of bother scale domain wise with the working status of the women was done, and we found that there was no statistically significant difference between the groups (P > 0.05) [Table 3]. 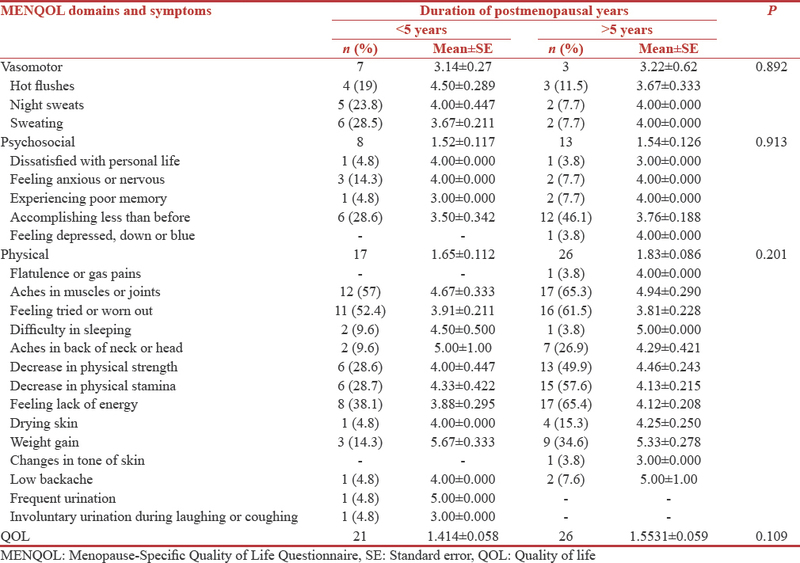 Menopausal symptoms when compared against age since menopause did not reveal any significance (P > 0.05). QOL for both groups was mildly affected [Table 4]. Multivariate linear regression [Table 5] of MENQOL was analyzed to assess factors influencing variation in domains. The independent variables entered in the regression models were occupation (employed/unemployed), chronic illness (yes/no), economic status (lower middle/upper middle), age, and time since menopause against various dependent variables for different models. Active emotional appeared to be the most utilized coping mechanism by both women and men. The scores in all domains of coping for males and females did not show any statistical difference [Table 6]. The current cross-sectional study aimed to understand the prevalence of postmenopausal symptoms, its effect on QOL and its association with education, occupation, and duration since menopause along with coping mechanisms used by the female and her male counterpart. The prevalence of postmenopausal symptoms was found to be 47% in this study. In general, we believe this is underreporting of symptoms, as we observed that the rural females did not perceive menopausal changes as a problem possibly due to lack of awareness. Of those reporting postmenopausal symptoms, the significant aggregate is within the physical domain (around 81%). This can be understood in two ways. Either physical symptoms are perceived more due to normal ageing process or they are overly emphasized, as a limitation to their daily work performance. Thus, they fail to acknowledge other forms of vasomotor, psychosocial, or sexual symptoms. Reporting of sexual symptoms in this study is zero; however, it cannot be taken as an actual depiction within the study population. As per our observation at the time of personal interviews, most females definitely shied away but more so, they were ignorant about the topic. The responses remained unchanged even when local health worker was asked to administer the sexual domain part of the questionnaire. It seemed that the rural females did not wish to talk about their sexual problems and decided to remain quiet on that. This does not necessarily mean that problems related to their sexual life do not exist. As per a study conducted in rural Southern India, 59% and 34% postmenopausal women expressed a loss of sexual desire and lack of sexual enjoyment, respectively. Above-mentioned study also documents statistics from the rural population, however, South India accounts for highest literacy rate within the country and therefore seems to have a better awareness of health issues. Thus, they have better reporting of postmenopausal symptoms than us. Univariate analysis of working and nonworking females [Table 3] does not demonstrate any significant difference. 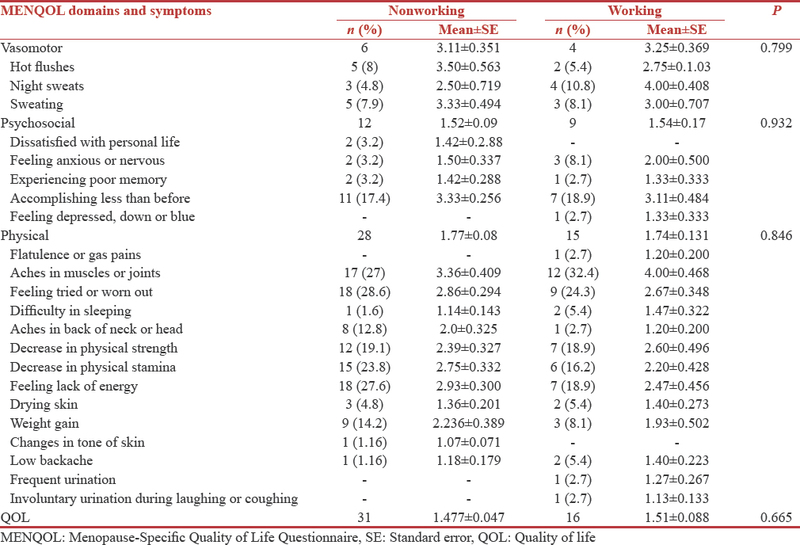 This is not consistent with other studies, which demonstrate that working females have better QOL.,,, The reason being, other mentioned studies have been conducted in an urban population where working females are financially independent and have social support at the workplace, thus demonstrate better QOL. This study is based on rural population, where working means either farming or based on daily wage. Given such circumstances, either the income does not get to the women, as it is handed over to the head of the family, or if at all she is in charge of her earnings, it is just enough for daily survival. Furthermore, laborious working conditions of these females are in and around the family; therefore, additional social support cannot be guaranteed. Thus, despite working, there is still lack of economic independence and social support, which affects QOL. Univariate analysis based on duration since menopause, [Table 4] demonstrated the very marginal difference, not statistically significant. A study conducted in an urban population in West Bengal shows that as age since menopause increases, vasomotor symptoms decrease, while physical and psychosocial symptoms increase. This is also consistent with a study conducted in Pakistan. The current study shows a similar trend in terms of frequency of symptoms; however, scores across both groups do not show any statistical significance. Decline in vasomotor symptoms during late perimenopausal phase can be explained in relation to hormonal changes (estrogen and progesterone). In the current study, this phenomenon does not completely hold true, as females fail to acknowledge most of the menopausal changes and consider it a part normal aging process. Other reason could be the difference in population characteristics such as education occupation, economic status, and most importantly living conditions. Multivariate linear regression model for this study was able to explain some variation in all domains (baring psychosocial). Age and economic status were able to explain 15% variation in the vasomotor domain, physical domain variation of 36.6% could be well explained by occupation, chronic illness and economic status, and overall QOL showed a variation of 21% due to occupation, chronic illness, and economic status. On the contrary, the psychosocial domain could not be commented on from the study, due to lack of reliable data. Domain was analyzed, however, it did not show any relevance, as a researcher was aware that the couple was answering the section just for the sake of it. A similar analysis conducted by the West Bengal study documented 29.5% variation in overall QOL due to duration since menopause, parity, husband's occupation, and profession. The same study has also documented a 45.7% variation in sexual domain due to similar variables. Coping of the couple has been analyzed through a bivariate analysis based on duration since menopause. In general, “acceptance” is the most used strategy by both partners, while males also use “religion” as a strategy. However, it can be rightly said that the couple does not actively cope toward menopause. Under coping could be a result of not considering menopause important in life with respect to other priorities. It is considered a natural process and that nothing needs to be done about it. Daily living is more of a concern than to think about menopause and its related changes. An additional observation about husbands' awareness regarding their wives' menopausal state was that despite of their awareness, they seemed to be ignorant and reluctant toward the acceptance of menopausal transition. To them, these changes are meant to occur and are part of one's life and thus do not demand much attention. Furthermore, both did not seem to perceive menopausal problems as any problem requiring or having any form of a medical solution. The study possibly has a limitation of cultural barrier between interviewers and rural couples. Due to this, there might have been reporting of inaccurate data, especially about sexual symptoms, which cannot be taken as the actual scenario. To overcome this issue, a trained personal from the same community could be a better option to conduct the interviews. Couples were found to be aware of menopause; however, the symptoms arising as consequence of it seem to be accepted as natural age-related change. In our study, we found the fair prevalence of 47%, which we still believe could be an underestimation. This could possibly be the reason for not taking any active coping strategy despite reporting of mild-to-moderate botheration by women and awareness in both. Probably, they do not perceive this as a problem related to menopause that can be addressed with some timely attention. Since overall QOL appeared to be influenced by occupation, chronic illness and socioeconomic status of the women, rigorous health education, and targeted awareness program about consequences and the available treatment options of menopause might be more beneficial in improving the health status of these women. Authors would like to thank Dr. Ravi Bhatt for his support in collecting data, Dr. Jacqueline Lewis for her inputs in understanding of MENQOL analysis and its implication in the study and Mr. Ajay Phatak for helping with study concept. Authors would also like to thank village health workers for their support in acquiring the data and participants for their participation. Christine LW. Women, Sports, and Performance: A Physiological Perspective. Champaign, Illinois. 1991. Whelan TJ, Goss PE, Ingle JN, Pater JL, Tu D, Pritchard K, et al. Assessment of quality of life in MA.17: A randomized, placebo-controlled trial of letrozole after 5 years of tamoxifen in postmenopausal women. J Clin Oncol 2005;23:6931-40. Kakkar V, Kaur D, Kaur IP. Positive Influence of Counseling in Relieving Menopausal Symptoms, Pharmacie Globale © (IJCP). 2012;3(4). Study protocol for the World Health Organization project to develop a quality of life assessment instrument (WHOQOL). Qual Life Res 1993;2:153-9. Żołnierczuk-Kieliszek D, Kulik TB, Jarosz MJ, Stefanowicz A, Pacian A, Pacian J, et al. Quality of life in peri- and post-menopausal polish women living in lublin province – Differences between urban and rural dwellers. Ann Agric Environ Med 2012;19:129-33. Kishor V, Kailesh B. Level of education and awareness about menopause among women of 40 to 60 years in Bhavnagar and Surat cities of Gujarat. Journal of Indian Association of Preventive and Social Medicine 2012;3:46-50. Rahman S, Salehin F, Iqbal A. Menopausal symptoms assessment among middle age women in Kushtia, Bangladesh. BMC Res Notes 2011;4:188. Hilditch JR, Lewis J, Peter A, van Maris B, Ross A, Franssen E, et al. 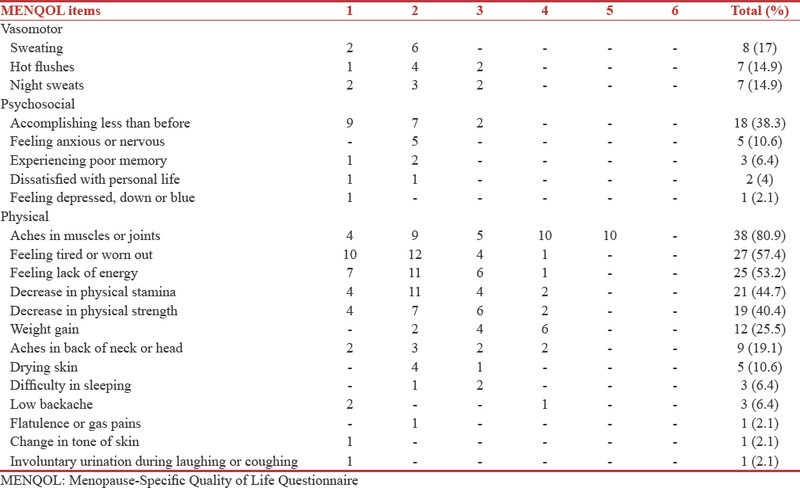 Amenopause-specific quality of life questionnaire: Development and psychometric properties. Maturitas 1996;24:161-75. Department of Psychology: College of Arts and Sciences, University of Miami; c2012. Available from: http://www.psy.miami.edu/faculty/ccarver/sclBrCOPE.html. [Last accessed on 2013 Jul 08]. Schnider K, Elhai J, Gray M. Coping style use predicts posttraumatic stress and complicated grief symptom severity among college students reporting a traumatic loss. J Couns Psychol 2007;54:344-50. Blumel JE, Castelo-Branco C, Binfa L, Gramegna G, Tacla X, Aracena B, et al. Quality of life after the menopause: A population study. Maturitas 2000;34:17-23. Fallahzadeh H. Quality of life after the menopause in Iran: A population study. Qual Life Res 2010;19:813-9. Oǧurlu N, Küçük M, Aksu H. Influence of employment status on menopausal symptoms. Int J Gynaecol Obstet 2011;112:204-7. Lock M. Menopause in cultural context. Exp Gerontol 1994;29:307-17. Som N, Ray S. Menopause-specific quality of life of urban women in West Bengal, India. Menopause Int 2012;18:99-105. Boulet MJ, Oddens BJ, Lehert P, Vemer HM, Visser A. Climacteric and menopause in seven South-East Asian countries. Maturitas 1994;19:157-76.